The Dawn of a Digital Future for Sports? iis finally happened. The machine has arrived in sports and it's here to stay. You can say what you like about the innate superiority of the human form, human judgement and human skills, but computers are training athletes, teaching coaches and forming team strategies. Some welcome computers as tools that will help bring out the best in human athletic performance. Others fear that computers will reduce competition to a battle for percentages and, in the long run, even replace humans on the playing field. There's an episode of the popular sci-fi TV show, The Twilight Zone, that predicts just such a future for boxing. In Rod Serling's somber vision, the brutal sport has been judged too dangerous for humans. By law, only robots may get in the ring and duke it out. In the story, a down-and-out handler - himself a former boxer from the days when humans fought - has gotten his nearly-obsolete robot a fight with a newer fighting machine. He knows his robot will be destroyed by the new model, yet he needs the money he'll get for the fight. So, he disguises himself as a robot and enters the ring himself - and, of course, he gets battered to oblivion. This show might be said to epitomize the fears of sports computerphobes. Will computers, robots, or men with computer parts make mere human competitors obsolete? Perhaps anticipating just such a danger, some sports people have been known to react violently to the presence of a computer on or near the playing field. right or left-handedness of the batter, past performance of each batter against today's opposing pitcher and so forth. Weaver took one look at the printout and tore it up. Today, Weaver has been put to pasture in the bland world of television sports commentary. And Dave Johnson has just become the manager of the New York Mets. Whether even the mightiest computer can help this perennial last-place team remains to be seen, of course. But, whatever his results, Johnson and his computer are in, and Weaver and the old guard are out. Many other major league baseball managers are already working closely with computers. But why do we want or need science and machinery in sports? The answer, in a word, is winning. Finding a way to shave a half second (or even less) from a 100 meter dash time, could mean the difference between a new world record and an unremarkable finish. Being able to identify your baseball team's perfect pinch hitter, say, against Steve Carlton - in the ninth inning with two outs and a man on third and given the contours of Shea Stadium - could mean the difference between winning and losing. If computers can give a coach even the slightest edge, he's going to want one. For that 100 meter sprinter, the computer can analyze filmed or electronically monitored data about stride length, stride speed, and many other factors essential to speed, to help him or her find ways to get better results. 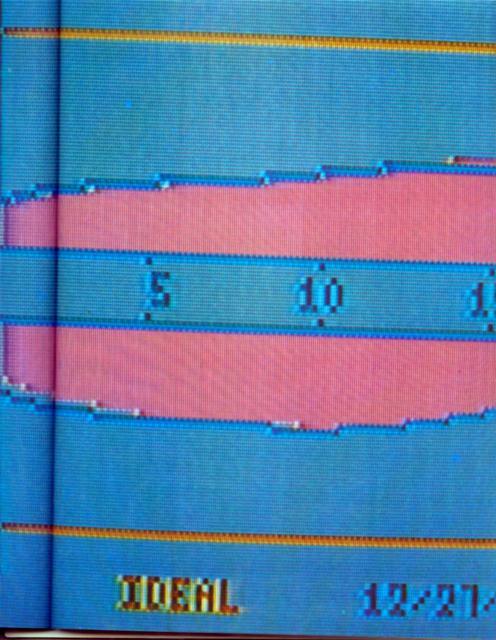 For a baseball manager, the computer can coordinate data about the odds of an event taking place, given past performance. Here, it's a predictor in a game where the goal is to maximize winning chances. of all, the ability to rise above one's own limitations. Bob Ward, P.E.D., is the con ditioning coach of the Dallas Cowboys football team. He rejects the notion that computers provide the only precise means of coordinating delicate training information, and he feels that many reports have exaggerated the computer's worth. "Not that science isn't valuable in sports;' says Ward. "But, intuitively, we comprehend very easily what is true, right and effective." Front, side and rear views of a computerised hurdler. 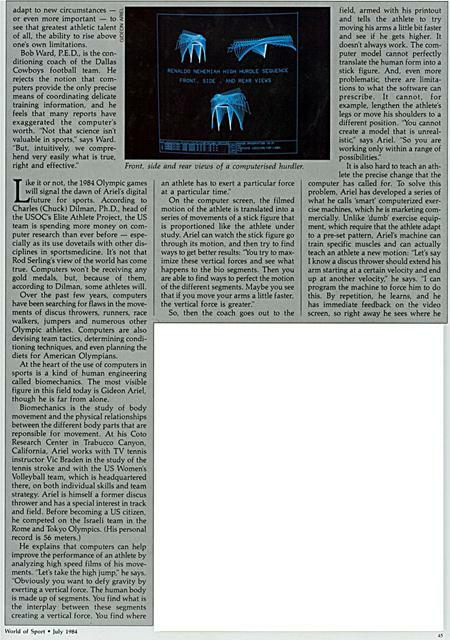 Tike it or not, the 1984 Olympic games will signal the dawn of Ariel's digital future for sports. According to Charles (Chuck) Dilman, Ph.D., head of the USOC's Elite Athlete Project, the US team is spending more money on computer research than ever before - especially as its use dovetails with other disciplines in sportsmedicine. It's not that Rod Serling's view of the world has come true. 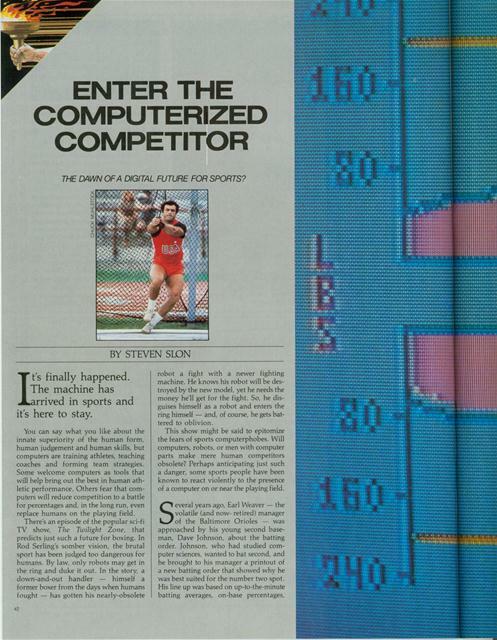 Computers won't be receiving any gold medals, but, because of them, according to Dilman, some athletes will. Over the past few years, computers have been searching for flaws in the movements of discus throwers, runners, race walkers, jumpers and numerous other Olympic athletes. 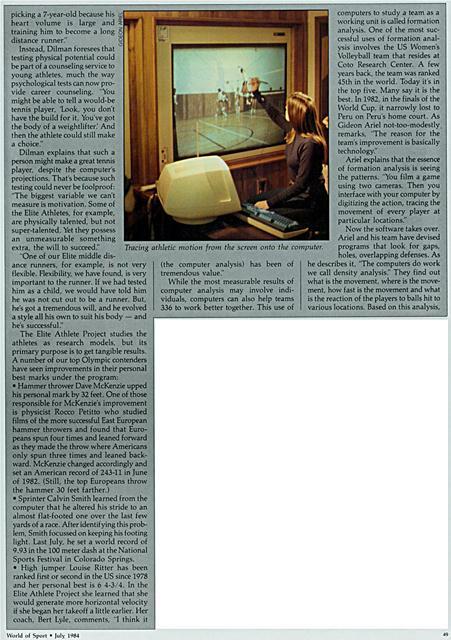 Computers are also devising team tactics, determining conditioning techniques, and even planning the diets for American Olympians. At the heart of the use of computers in sports is a kind of human engineering called biomechanics. The most visible figure in this field today is Gideon Ariel, though he is far from alone. 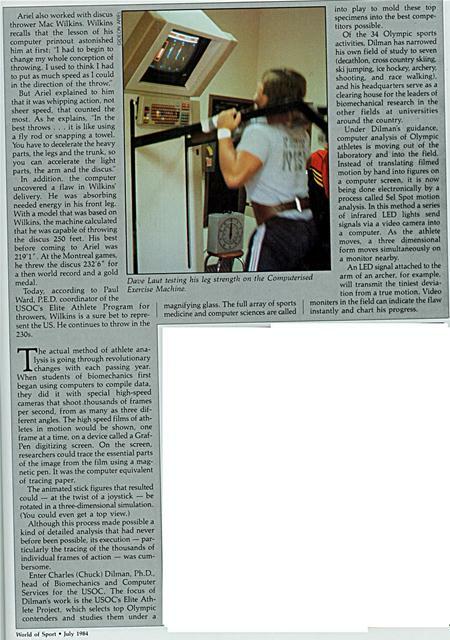 He explains that computers can help improve the performance of an athlete by analyzing high speed films of his movements. "Let's take the high jump;' he says. "Obviously you want to defy gravity by exerting a vertical force. The human body is made up of segments. You find what is the interplay between these segments creating a vertical force. You find where an athlete has to exert a particular force at a particular time." Gideon Ariel standing beside the 'Smart' Exerciser. Biomechanics has also demystified hitherto unknown aspects of certain sports. In ice hockey, for example, it used to be a marvel that the great shooters could generate so much force with their slap shots. It didn't seem physically possible to derive such tremendous puck speeds from merely swinging the hockey stick. Computers solved that mystery: The hockey stick hits down on the ice behind the puck, bends back and then snaps forward, whipping the puck with a tremendously amplified force. Three years later, the 44-year-old Oerter had thrown the discus 27 feet farther than his best gold medal distance, 212-6, and he got a spot on the 1980 US Olympic team. 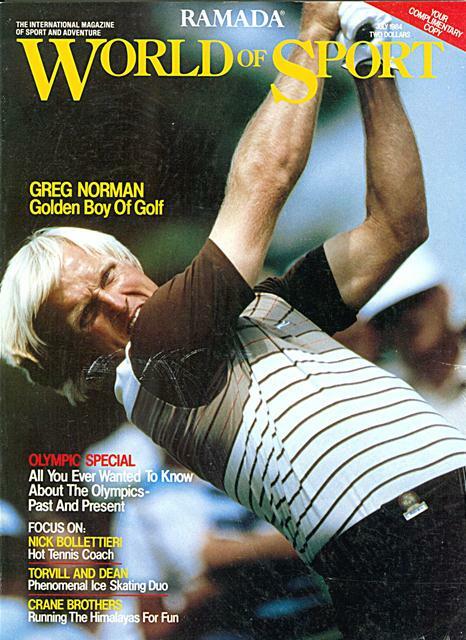 The team never went to Moscow, of course, so Oerter is still talking about trying out for the US team in 1984. In addition, the computer uncovered a flaw in Wilkins' delivery. He was absorbing needed energy in his front leg. With a model that was based on Wilkins, the machine calculated that he was capable of throwing the discus 250 feet. His best before coming to Ariel was 219'1". At the Montreal games, he threw the discus 232'6" for a then world record and a gold medal. Today, according to Paul Exercise Machine. Ward, PER coordinator of the USOC's Elite Athlete Program for I magnifying glass. The full array of sports throwers, Wilkins is a sure bet to repre- medicine and computer sciences are called sent the US. He continues to throw in the 230s. he actual method of athlete analysis is going through revolutionary changes with each passing year. When students of biomechanics first began using computers to compile data, they did it with special high-speed cameras that shoot thousands of frames per second, from as many as three different angles. The high speed films of athletes in motion would be shown, one frame at a time, on a device called a GrafPen digitizing screen. On the screen, researchers could trace the essential parts of the image from the film using a magnetic pen. It was the computer equivalent of tracing paper. Although this process made possible a kind of detailed analysis that had never before been possible, its execution - particularly the tracing of the thousands of individual frames of action - was cumbersome. into play to mold these top specimens into the best competitors possible. Of the 34 Olympic sports activities, Dilman has narrowed his own field of study to seven (decathlon, cross country skiing, ski jumping, ice hockey, archery, shooting, and race walking), and his headquarters serve as a clearing house for the leaders of biomechanical research in the other fields at universities around the country. Under Dilman's guidance, computer analysis of Olympic athletes is moving out of the laboratory and into the field. Instead of translating filmed motion by hand into figures on a computer screen, it is now being done electronically by a process called Sel Spot motion analysis. In this method a series of infrared LED lights send signals via a video camera into a computer. As the athlete moves, a three dimensional form moves simultaneously on a monitor nearby. An LED signal attached to the arm of an archer, for example, will transmit the tiniest deviation from a true motion. Video moniters in the field can indicate the flaw instantly and chart his progress. Reference marker for Computerised Biochemical Analysis and set up for Computerised Force Plate Analysis. At present, he is finding that a combination of psychology and computer analysis provide the best results. When he finds a weakness, he gives the athlete a visual image to help him correct the flaw. "For example," Dilman explains, "a common problem with race walkers is a slight asymmetry between the right and the left legs. They may have an abrupt impact with the left leg, causing a braking action, and be smooth with the right. We would have the athlete in question watch films or videotapes of himself in slow motion. Then we would tell him to visualize the smoothlanding right leg and imagine that the left leg is landing that way." Another part of the Elite Athlete Project involves measuring the athletes' organic capacities. An athlete can only push him or herself so far before the muscles begin to use more oxygen than the body can supply. The goal is to identify the point just before that happens so that an athlete can expend maximum energy and still replenish lost oxygen. But each athlete has a different maximum efficiency point. To find it, they run on treadmills, wired to computers that will instantaneously identify when they've gone beyond this point - called the anaerobic threshold. The computers also spit out information about fluctuations in their respiratory rates, pulse rates, blood pressure, body temperature and more. Part of the purpose of this study is to try to identify the particular physical requirements for given sports. That knowledge could make it possible to predict a would-be athlete's best sport, given his or her raw physical endowments. The inevitable question is - will computers someday be used to select talented athletes as early as grade school to begin training for the sport they are best suited to? Instead, Dilman foresees that testing physical potential could be part of a counseling service to young athletes, much the way psychological tests can now provide career counseling. "You might be able to tell a would-be tennis player, 'Look, you don't have the build for it. You've got the body of a weightlifter.' And then the athlete could still make a choice"
"One of our Elite middle disance runners, for example, is not very flexible. Flexibility, we have found, is very important to the runner. If we had tested him as a child, we would have told him he was not cut out to be a runner. But, he's got a tremendous will, and he evolved a style all his own to suit his body - and he's successful:"
Sprinter Calvin Smith learned from the computer that he altered his stride to an almost flat-footed one over the last few yards of a race. After identifying this problem, Smith focussed on keeping his footing light. Last July, he set a world record of 9.93 in the 100 meter dash at the National Sports Festival in Colorado Springs. Tracing athletic motion from the screen onto the computer. Ah, but is it sporting? Ariel thinks so. In fact, as he describes it, computer information merely raises strategy to a higher level. He points out that you cannot cover all your weaknesses, but, knowing them, you are better equipped to make strategic decisions. Knowing precisely where you are weak would be especially beneficial to a pro team at draft time. The tendency is to want to pick the best all-round player available, but, Ariel says, "The first draft choice for a particular team could be the worst for another." Before Moses Malone was picked up by Philadelphia, in 1982, FAMS judged that the team with the most to gain by hisacquisition was the New Jersey Nets. A complex series of calculations took into account the Nets' then-current offensive statistics and then added Malone, figuring that he would raise the team's winning percentage by 50 percent and draw an additional 5,695 spectators per game. Valuing each ticket sale at 512.50, including parking and concession-stand earnings, Malone would have brought the Nets nearly S3 million extra per season, according to FAMS. 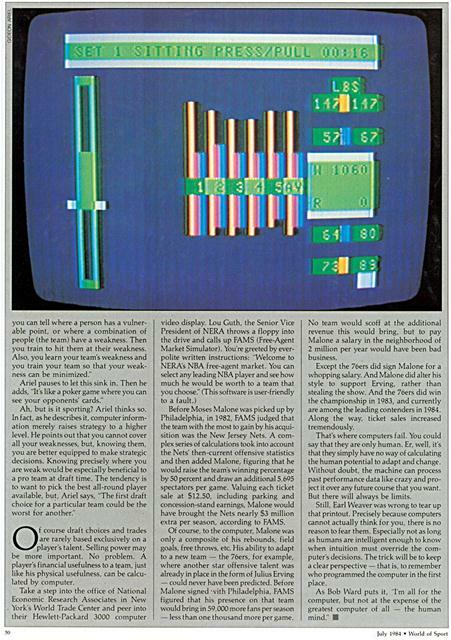 Of course, to the computer, Malone was only a composite of his rebounds, field goals, free throws, etc. His ability to adapt to a new team - the 76ers, for example, where another star offensive talent was already in place in the form of Julius Erving - could never have been predicted. Before Malone signed with Philadelphia, FAMS figured that his presence on that team would bring in 59,000 more fans per season - less than one thousand more per game. No team would scoff at the additional revenue this would bring, but to pay Malone a salary in the neighborhood of 2 million per year would have been bad business. Except the 76ers did sign Malone for a whopping salary. And Malone did alter his style to support Erving, rather than stealing the show. And the leers did win the championship in 1983, and currently are among the leading contenders in 1984. Along the way, ticket sales increased tremendously. That's where computers fail. You could say that they are only human. Er, well, it's that they simply have no way of calculating the human potential to adapt and change. Without doubt, the machine can process past performance data like crazy and project it over any future course that you want. But there will always be limits. Still, Earl Weaver was wrong to tear up that printout. Precisely because computers cannot actually think for you, there is no reason to fear them. Especially not as long as humans are intelligent enough to know when intuition must override the computer's decisions. The trick will be to keep a clear perspective - that is, to remember who programmed the computer in the first place. Generated on 4/20/2019 3:29:06 PM (PST) ADI/HQ/GBA/2019/ARIELCLOUD/v3.0.2018.0126.